Add a glint to your woodland garden. 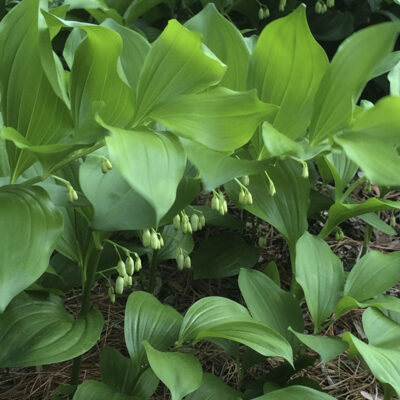 Glossy, broad, 8″ green leaves give way to arching stems with nodding green-tipped white bells in late spring. Showy blue fruit follows. Use as a groundcover. A 2′ wide patch will grow in 5 years. Attractive in shady borders and as understory to woodland shrubs and statuesque ferns. Full shade. Height 15″. Spread 12″. All parts of plant can cause mild stomach upset if ingested. Zones 5-8.